This is a quick and fairly inexpensive meal that's a real treat. Coat veal lightly and evenly in seasoned flour. Heat butter and oil together (the oil stops the butter from burning). Add mushrooms and onion to pan and cook for a couple of minutes, until onion is softened and slightly browned. Mix together the wine, stock and tomato paste. Pour over the mushrooms and onions. Add browned veal pieces and cook til the meat is heated through. Serve over garlic mashed potatoes or noodles. 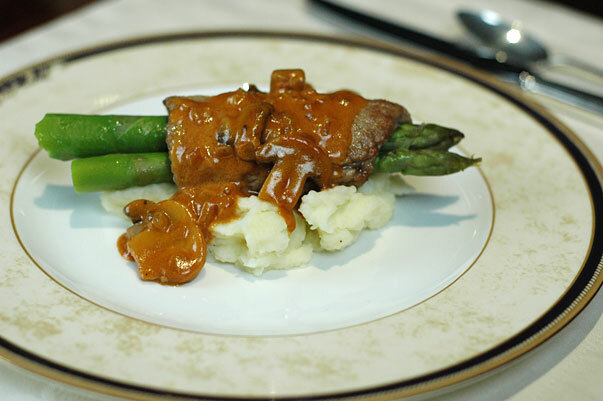 If you wish to make a lovely presentation, keep the veal warm and roll two spears of asparagus up in a piece of veal and place it on top of mashed potatoes and pour over the sauce.